Art By Yukari: Me, A Perfectionist? I think I mentioned before that my art journal pieces are usually driven by words, often a quote, and sometimes a poem. I then think of ways to visually represent the words. But for this piece (and the one I'm currently working), I started with inspiration pieces, both found on Pinterest. You can find it here and here. How interesting to draw a face on a map! 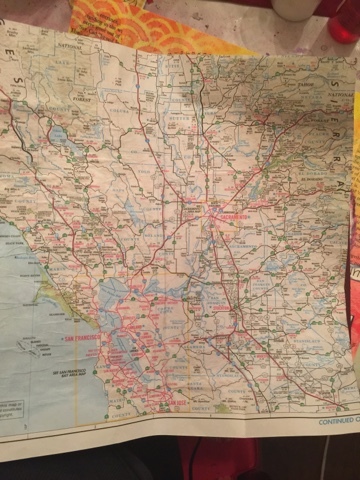 We have a few AAA maps we used to use that we no longer use (thanks to GPS). So I chose a map of California to use. I chose a section of the map I wanted to use for the face and glued the map onto my journal. And then I got stuck. I didn't want to exactly mimic my inspiration page and because I didn't have a quote or a poem that helped me visualize the final product, I just couldn't think of what do do next. I haven't finished this yet, but working on it. 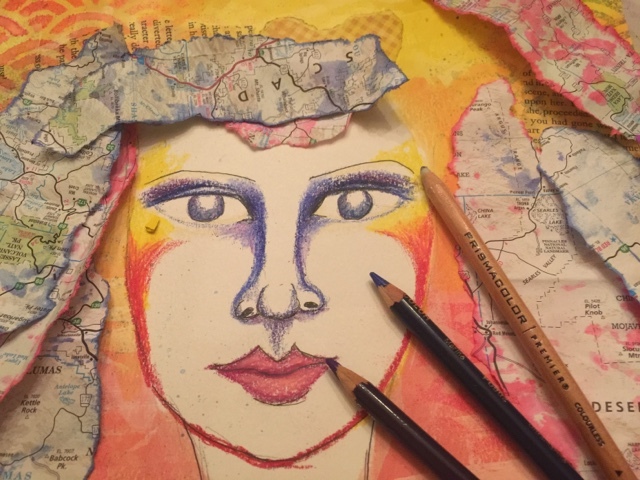 And now I had extra map scraps so I decided to used them for my second inspiration piece, the one in which scraps of paper were used to create hair for a figure of a woman. 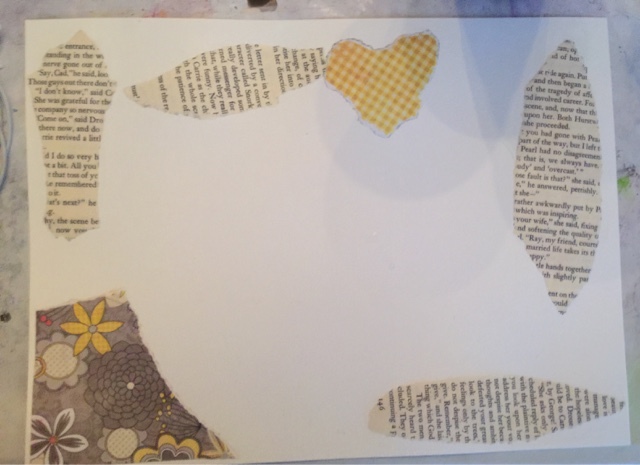 I began by tearing and gluing scraps of pages from an old book and from my scrapbook stash. I used matte medium to adhere the scraps. I also randomly 'painted' the medium all over the page to add a bit of texture to the page. 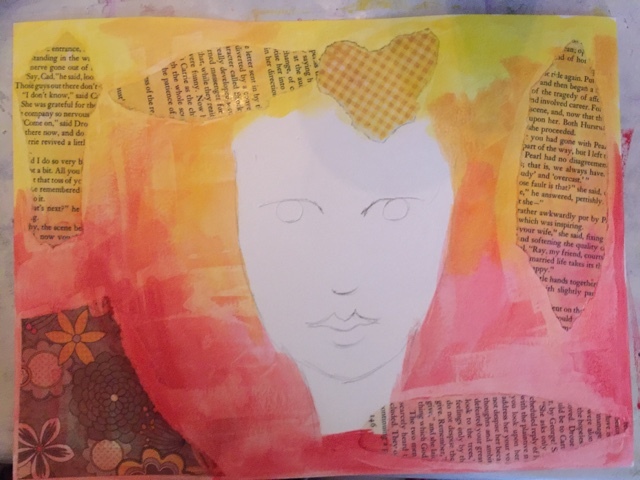 I then used my inktense blocks to add color, leaving portion of it white where the face would be. 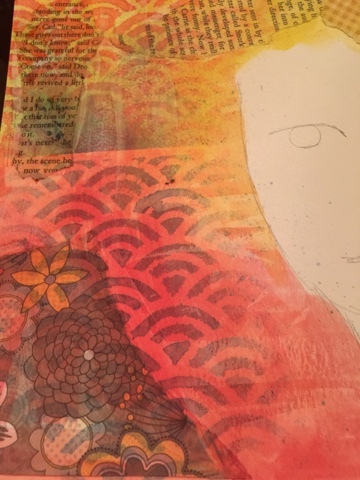 I wanted to add more texture to the page so I used a stencil and my homemade ink spray to add a pattern. 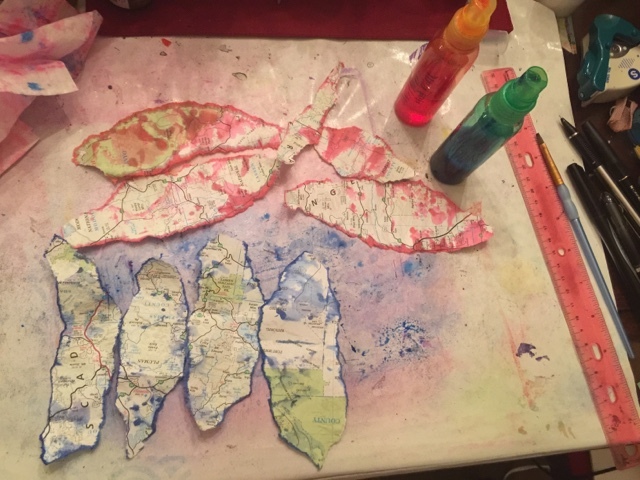 I tore pieces of the map to create the hair but before adhering the pieces, I colored the pieces lightly with the spray. I drew the face in with Prismacolor pencils. I didn't want to use traditional facial colors so I kept the face mainly white. Once I glued the hair, I had to find a quote. The quote got me to thinking, on this journey, do I just follow the road, randomly turning, not knowing where I am or do I use a map to orient myself? I'm definitely a map user. On trips, even though we use our GPS, I still like to review the routes so that I can get the big picture in my mind. My husband, on the other hand, just follows the GPS. Even with my art, I usually know the general direction I'm headed even though I may not know the outcome. I really would like to be more organic when I'm creating art, but I wonder if I would ever feel comfortable just letting go. Well, what does this have to do with being a perfectionist? None of my pieces are perfect, but most are carefully planned out. I have done a few pieces in which I let things flow. But most of those pieces are unfinished, never shown, they are not fit for public consumption. But perhaps those pieces show my stream of consciousness. I think in order for me to grow as an artist, I need to let go, stop using the pencil and use a pen. How about you? Are you a planner or a spontaneous spirit? I'm in the middle...if that makes sense. This is too cool! I am a planner in numerous aspects of my life but then very spontaneous in other aspects! I try to let go as I create and allow the page to come together slowly. It is interesting to see everyone's approach. S LEW, me too. some stuff mulls around in my head for a while before i get the idea of where i'm going and then once the pen goes to paper it has a direction, but, its of the moment. However there are days that a squiggle just turns into a mermaid shopping at Kmart. how did that happen, don't know i was just in the moment. I do a little of both. Sometimes I'll see a prompt and know exactly what I'm going to do, and then other times I have to mull it over for a little bit. Right now I'm mulling over a few things, and I'm behind in my journaling because of it, LOL. But it will come to me and then I'll be in that moment/zone. 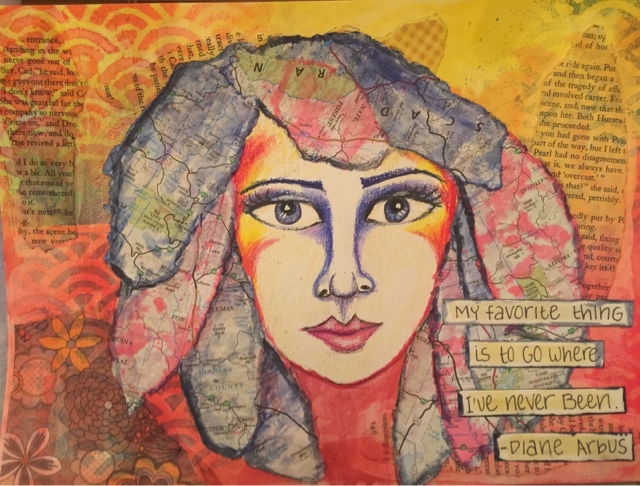 I love that about art journaling. It's whatever you want or need it to be. This one is amazing. I love it when things are used in a different way than they are intended. However the significance of the thing (the map, in this case) remains. Just beautiful. definitely I prefer random. I love your beautiful spread.